School security officers outnumber counselors in four out of the 10 largest public school districts in the country — including three of the top five — according to data obtained by The 74. New York City, Chicago, Miami-Dade County and Houston schools all employ more security staff than counselors. New York City, Chicago and Miami-Dade are all among the nation’s five biggest school districts. Not one of the top 10 districts, where counselors may be particularly beneficial for low-income students, meets the American School Counselor Association’s recommendation of one counselor for every 250 students — most weren’t even close. The nearest to the standard was Hawaii with 274 students for every counselor. Los Angeles Unified, which has the largest school police department in the nation for K-12 schools, has less than one security staffer for each 1,000 students and one counselor for every 824 students. “To give a ratio of our total police force numbers can be misleading,” said Steven Zipperman, LA Unified’s chief of police. “We have a 24/7 police protection” that goes beyond school yards and school hours to include detectives and officers assigned to asset protection and specialized units. The 74’s analysis comes as the debate over school safety, classroom violence and the school-to-prison pipeline continues to dominate national headlines and inform federal policy. The ACLU has called attention to federal data showing that public schools disproportionately discipline students of color — especially black males — and disabled students. Students subjected to harsh discipline are more likely to end up in the criminal justice system. Zipperman said LA Unified’s force, which includes 400 sworn police officers of all ranks, has not increased since the 2012-13 and 2013-14 school years, when officers were added to catch up with the last district build-out of bond-funded new schools. His officers patrol all district high schools, numbering about 90, and about a third of all middle schools. Independent charters are not included unless they are co-located with district schools or contract with LA Unified. The four charter high schools that contract with LA Unified police are Palisades Charter, El Camino Real Charter, Granada Hills Charter and Birmingham Community Charter. “I don’t know if there is a correlation right now between police officers and restorative justice,” a new district discipline policy, Zipperman said. But he pointed to the district’s “very successful” diversion program, begun in 2014. “Many who would have gotten a citation are now in the diversion program,” he said, adding, “We have done a lot of collaborating with [social justice programs] to get to the root of problems,” including the Community Rights Campaign and Dignity in Schools Campaign. Counselor Cory Notestine works in Colorado Springs School District 11 and was named school counselor of the year by the American School Counselor Association for 2015-16. “I do find it alarming that we would have more resource officers in [some] schools than we would have school counselors,” he said. School counselors’ roles vary depending on where they work, but often focus on helping students deal with academic, behavior, and social issues. High school counselors play a key role in helping students get into college. School security can range from uniformed personnel employed by the district to maintain school safety to armed police officers who can make arrests. Los Angeles Unified has its own police force, as does Houston. Other districts, like Hawaii, have no police presence in its schools, employing only safety personnel. New York City and Hawaii have high numbers of both security staff and counselors; while Houston and Los Angeles have low numbers of both. New York City added 250 counselors in the last two years and is planning to add more, according to the Department of Education. “Our goal is to provide a safe, respectful and supportive environment for students to thrive academically and socially. We are working across city agencies, including NYPD and FDNY, to ensure the safety and security of students and staff,” Toya Holness, a DOE spokesperson, said of New York’s security-to-counselors ratio. The recent public debate in New York City has veered between safety concerns and criticism of harsh discipline, with three reports in the past two weeks of students bringing guns to school and a related battle ensuing over whether city charter schools suspend students too freely. Charter schools are public schools but their enrollment numbers were not used in The 74’s calculation of staff per pupil because they are independently run, including hiring their own staff1. In some instances, such as when they are in the same building, charters and traditional public schools can share security. The national average of school counselors per students as of 2013-14 was about 2 counselors per 1,000 students and six of the top 10 districts — New York City, Chicago, Clark County, Miami-Dade, Hillsborough County and Hawaii — did beat that. Miami-Dade employs more than six security staffers for every 1,000 students, though about 40 percent are part time. New York City employs more than five security personnel for every 1,000 students and Chicago over four. Nevada’s Clark County has the most counselors per security staff at a ratio of 4-to-1, while Miami-Dade has the lowest, at about 0.4 counselors for each security personnel. There was significant variation from district to district for both sets of numbers, but it was much wider for security staff than counselors. That suggests districts have a good deal of discretion when deciding how much they want to spend attempting to maintain order, prevent crimes or respond to in-school incidents. David Osher, a vice president of the American Institute of Research has studied issues that affect what’s called “school climate,” a broad term that encompasses everything from how safe a school feels to how well students relate to the adults to how high teachers set expectations for learning. He said he found it “troubling” that districts might employ more security staff than counselors. Osher emphasized that what matters isn’t necessarily the titles that different adults in schools have, but whether they played a positive role in strengthening school climate. The records requested by The 74 did not include social workers or psychologists, who may also help students who are struggling academically or emotionally. However, in Chicago, New York, and Houston, three districts that provided the number of social workers, even adding them in did not alter the big picture. Each still employed more security staff than school counselors and social workers combined. There has been increased attention in recent years to the idea that schools contribute to over-incarceration, particularly among students of color. Viral videos of police officers assaulting students in schools has brought anger and outrage over cops using excessive force in classrooms. “I don’t think schools are an oasis from the racial problems that affect the rest of society,” said Parker of the ACLU. Students of color make up the majority of all 10 of the largest school districts. Federal data show that black students in particular are significantly more likely to receive harsh discipline, including out-of-school suspension and expulsion, particularly from white teachers. National data also reveal that schools with high proportions of students of color are significantly more likely to have security personnel. Parker said that adding security to schools has led to some normal school infractions, like dress code violations, being handled by law enforcement rather than school staff. That can result in a student being arrested and having to appear in court. Many school security officers receive minimal or inadequate training, particularly in dealing with special education students. As previously reported by The 74, the majority of states have no specific laws mandating that officers deployed to classrooms receive special training in dealing with children. Parker argues that investing in reactive methods over proactive ones is a mistake. “If there were more emphasis on preventing problems rather than dealing with them when they happen, schools would ultimately be safer and students performance would be better,” he said. One study found that even after controlling for poverty levels, schools with more resource officers had higher arrest rates for the subjective offense of “disorderly conduct.” However, the same study showed that arrest rates for assault and weapons charges actually dropped with security staff present. Many districts across the country — including New York City, Los Angeles and Chicago — are working to reduce punitive discipline in schools, including suspensions, expulsions, and arrests, fearing that those punishments contribute to the school-to-prison pipeline. Critics have argued that such efforts can make schools less safe and learning more challenging. But it’s not clear that there is any evidence, beyond anecdotes, to support these claims. Little, if any rigorous research, links an increase in school security to improvements in school climate. It’s difficult to know what value security staff bring to schools and what the appropriate level of staffing might be. Meanwhile, research has generally found that school counselors have a positive effect on students, including increased achievement, and decreased discipline incidents, particularly for low-income students of color. Counselors may be particularly valuable in large urban districts — like the top 10 — where the enrollment is heavily low income, and the need may be greater. A lack of counselors may leave students struggling, without professional support, to deal with out-of-school challenges that affect learning or to navigate complex and unfamiliar college admissions processes. Osher agreed with the ACLU’s Parker that schools should emphasize strategies to avert discipline issues rather than those that deal with them after the fact. Disclosure: In reporter Matt Barnum’s previous job at Educators for Excellence — New York, he worked with teachers to advocate for less punitive discipline practices in New York City schools. Note: Enrollment numbers do not include students who attend charter schools, except Houston where charter school enrollment could not be broken out. The data come with a number of important caveats, and should be interpreted carefully. Districts may have different standards for what counts as security staff. The 74 requested records showing the number of police officers and school resource officers or school safety agents5. Districts may also have different proportions of part-time staff, which are generally not broken out in these data. In Miami-Dade, for instance, about 40 percent of personnel were part time. 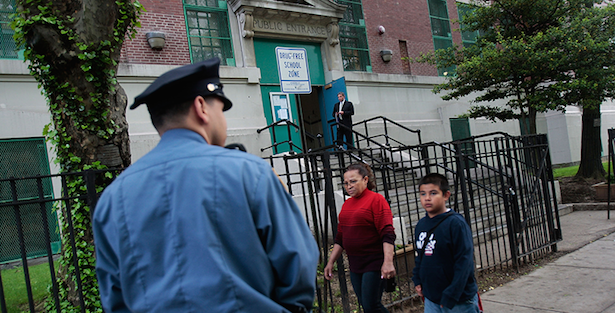 In some districts, like New York City, school-based security are part of the New York City Police Department; other districts have both police and school safety staff. The numbers reported here are the total of police officers and security staff. The data was collected over the course of several months, in late 2015 and early 2016, so it’s possible that some of the numbers have changed slightly since they were received. This also applies to student enrollment data that was used to calculate the number of staff per student. It is unlikely, though, that any of the data has changed dramatically.